The latest Police Boots available at a bargain price. 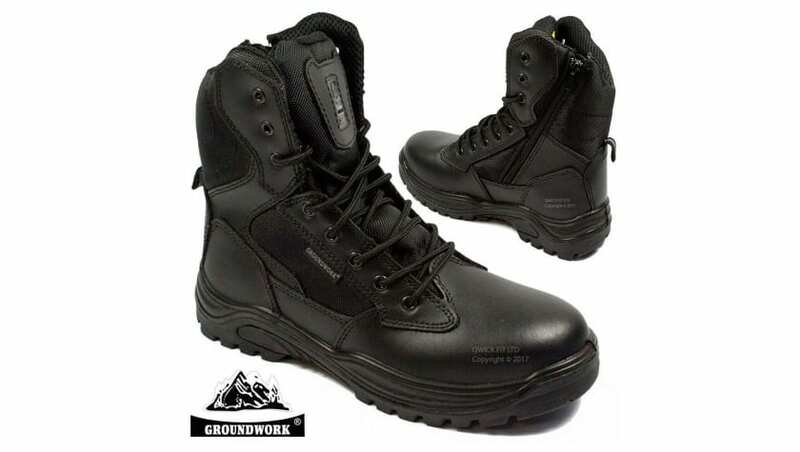 The Groundwork Boots are available from sizes 4 – 14. They are made from leather with soles that have been designed for anti slip resistant. These Boots come with a side zip which means that they can be put on and taken off very easily. Due to the design they are mostly water resistant, but standing in few inches of water will untlimately mean your feet will get wet as there is only material covering on the outisde of the boot. The manufacture states the soles are anti sli resistant and oil resistant. I’ve not tested this, however the sole does appear to be fairly robust and provides good grip like some of the more expensive boots. The only issue would be how long the sole last with continuous wear. Overall these boots will do for Police work and the price means that they are very affordable. There is no reinforcement (i.e. toe cap) at the front, which some officers prefer but the boot should give ample protection for the daily wear of Police duties. Own a Pair of these? If you do purchase a pair of these boots and would like to give your feedback, you can log-in and comment below. We would love to hear your comments to share with our community.